AC fans are used to provide forced air cooling that helps remove the heat generated by Electro- mechanical components. Y.S. Tech U.S.A. provides axial fans in five size options ranging from 80x25 mm to 92x38mm. 80x25 ADT AC Fans provide airflow of 38.0~55.1 CFM and static pressure of 3.9~6.6mm H2O. Features UL plastic blades and a die-cast aluminum frame. 80x25 KT AC Fans have an airflow range of 14.5~18.3 CFM and static pressure range of 3.31~5.16mm H20. features a die-cast aluminum frame and UL-rated plastic blades. 80x38 KT AC Fans provide 16.7~24.3 CFM of airflow and have astatic pressure range of 2.88~6.29 mm H2O. The frame is constructed from die-cast aluminum and fan blades are UL rated plastic material. 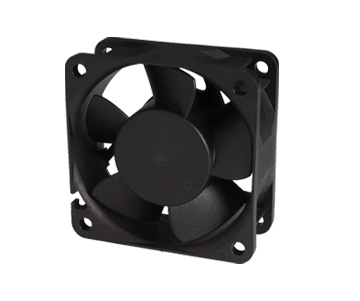 95x25 KT AC Fans have an airflow range of 17.3~32.0 CFM and static pressure of 1.39~5.70mm H2O. The plastic material UL rated blades are housed in a die-cast aluminum frame for durability. 92x38 KT AC Fans provide an airflow range of 34.0~47.0 CFM and static pressure range of 2.20~6.00 mm H2O. Features a die-cast aluminum frame and plastic material UL rated blades. Select the size appropriate for your thermal management application to request a quote for pricing or contact us for additional information. Use temperature sensors to determine how much heat your system generated under various operating conditions, then use that information to create a thermal profile. Determine your system’s air impedance, which will aid in selecting a fan size and air flow requirements for optimum heat absorption. Use the maximum permissible temperature and amount of heat generated to calculate the amount of airflow required to effectively cool your system. After determining the operating temperature range, you need to determine the system’s allowable temperature range and how many watts of heat are dissipated during operation. Knowing your system’s air impedance and acoustic specifications are also important and finally. Once you have all of the thermal requirements, the final step is to measure the dimensions of the area where the AC fan will be installed. This information will then be used to select an axial fan that matches your system requirements. Y.S. Tech U.S.A. provides a range of options up to 160-254mm for your industrial cooling applications. For additional product and sizing information, see our overview page for axial flow AC fans and contact us if you have any questions.